It became the Marx Brothers’ first feature film, released by Paramount Pictures in 1929, but it began as a Broadway musical in 1925, with book by George S. Kaufman and music and lyrics by Irving Berlin. Cocoanuts is a musical romantic comedy invaded by vaudeville. 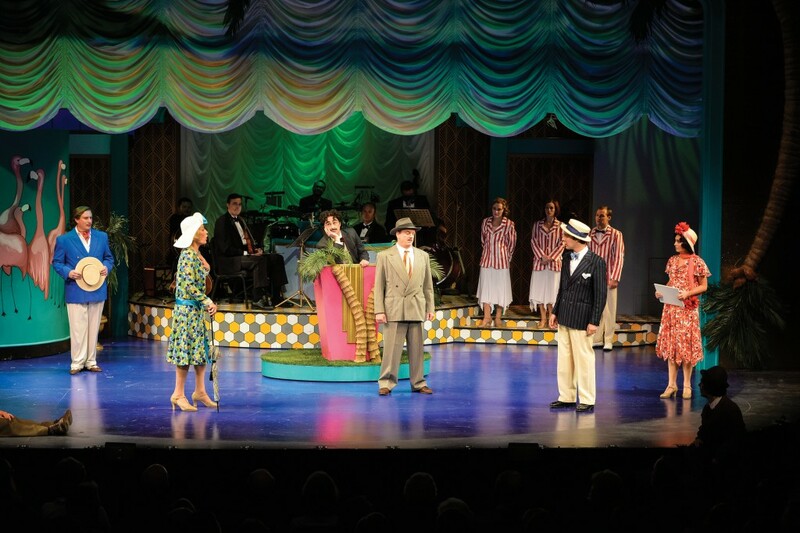 Adapted by Mark Bedard and Gregg Coffin, and directed by Melissa Rain Anderson, it opens this year’s Utah Shakespeare Festival with the type of slapstick romp that charms audiences every year. A young man, Jamison (John Wascavage), has big plans for the future but can’t marry Polly (Anna Landy), the girl of his dreams (as well as a rich heiress) until he can prove his worth—currently he’s an overworked, underpaid bellhop. Their love affair is further complicated by Harvey Yates (Michael A. Harding), a middle-aged suitor from a pedigreed family who sees Polly as the answer to his accumulating debts; and Mrs. Potter (Kathleen M. Brady), the stuffy matriarch who is partial to Harvey and averse to scandals of any kind. The ensuing plot doesn’t add up to much and isn’t particularly important—there’s the case of a stolen necklace, an engagement party in Spanish costume, and a rigged real-estate auction gone awry—because it’s all a set up for the Marx Brothers’ humor and the tunes of Irving Berlin. The Marx Brothers were established entertainers by the time Berlin and Kaufman created the musical—their physical humor, jumbled wordplay and oddball characters were all well-developed. Theirs was a type of vaudeville humor that might seem dated today, but either out of nostalgia (the festival audience tends to be disproportionately silver-haired) or pure enjoyment, the audience, a la Harpo, ate it up. Four of the Marx Brothers appear on the Randall L. Jones stage. Unless you’re an aficionado, you might not notice Wascavage’s Jamison as Zeppo Marx, younger brother to the more famous trio. 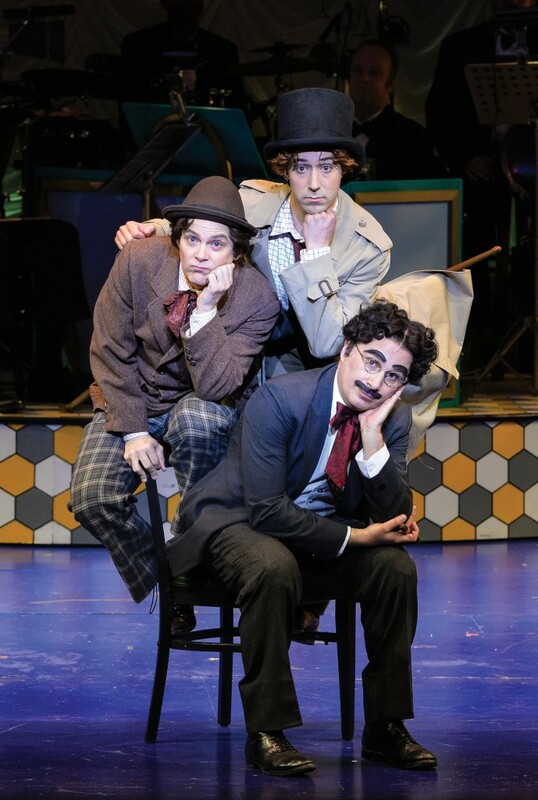 But in the case of the trio, comparisons to the original will be hard to avoid: Jim Poulos lays heavy on the Italian accent for his role as Chico Marx and Tasso Feldman endears in the much-loved character of Harpo. It is John Plumpis as Groucho, however, who must carry the play, with his inverted wordplay and atrocious puns. He relishes the role, and made up for any opening-day fumbling with lines both ad libbed and localized — creating humor at the expense of the visiting governor, Gary Herbert, and the nearby town of Panguitch. The comic troupe is fleshed out by Chris Mixon who makes an appearance or two as the fedora-clad Detective Henessey, frequently shirtless and not particularly hardboiled, Melinda Parrett as a shoulder-swaying, throaty seductress Penelope Martin and Josh Durfey, Nicki Elledge and Natasha Harris as a chorus of sorts, with their own comedic moments. Jo Winiarski’s charming set evokes the era of the boom and bust economy of 1920s Florida while adroitly incorporating a five-piece orchestra. The Marx Brothers began as a musical group — they only stumbled into comedy — and the cast hits the musical notes as well as the comedic ones. It’s no easy task to inhabit the roles of much-loved icons, but by the end of the performance the players had embodied their roles so well, it was hard to recall the originals. 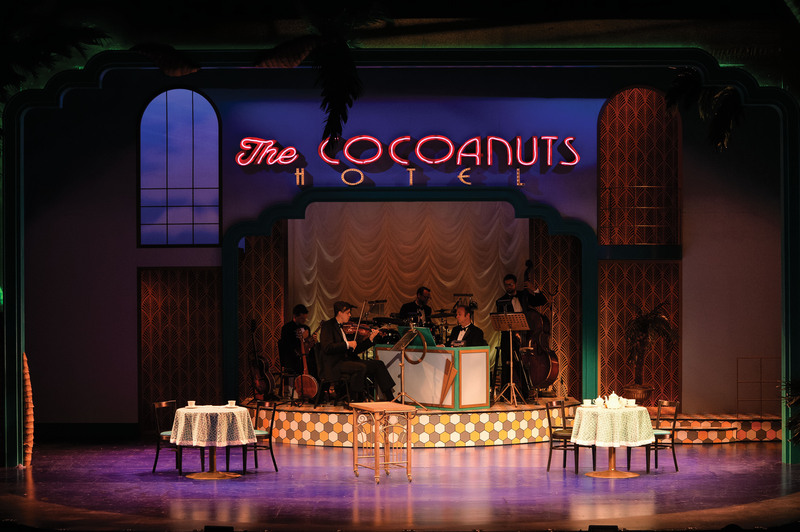 The Cocoanuts is at the Randall L. Jones Theatre on the Southern Utah University campus through October 15. For more info, visit bard.org. Being a good editor, and Shawn Rossiter does a superb job as 15 Bytes’ Jefe de Redacción, is no guarantee of good writing, so I hasten to point out that Editor Rossiter has herein boiled down an encyclopedia of Marx Brothers facts and trivia, producing in the process an excellent introduction to Cocoanuts and the decades of brilliant tomfoolery that followed. I could say more, but I’m told I have updates available, and must restart to reinstall.